It is said that beauty lies in the eyes of beholder. Techniques and treatments have been refined and playing an important role to jazz up a simple object or face. Beauty treatments have always been in vogue to enhance looks and the booming entertainment industry is motivating many people to pursue career as a makeup artist. Standing tall in modeling and fashion world, the art of makeup will never fade in future. This has resulted in a growing need for professionals to make people look good, rev up looks and help them make a style statement. Make-up is an art and a make-up artist is a professional artist who uses various mediums to transform and boost the appearance of a person. Make-up artist uses human skin as a canvas and makeup as a medium. 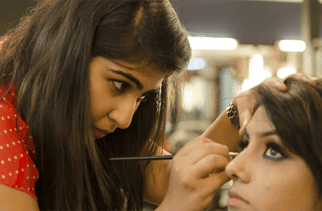 They apply makeup and prosthetics for theatrical, television, film, fashion shows, magazines, photo shoots, ramp walk and other such productions and events. The art of makeup is basic requirement in professions such as modeling, film production, page 3 parties, high-profile events, stage shows, studio live, dance and reality programmes besides other such activities. There are two main categories of makeup artist. Cosmetic or fashion artists. The Cosmetic artist can work anywhere, while latter prepares fashion models for photo shoots. The artist knows how to make the model look her or his best and understands the different effects required by lighting and digital photography. The fashion artist also helps fashion designers to create a certain look for the model, such as emphasizing lip shape or cheekbones. Makeup artists are in high demand for weddings, fashion shoots, fashion shows, corporate photography and other high profile events that will be photographed or recorded. Like a fashion makeup artist, theatrical and film makeup artists learn to work with different lighting conditions, sets, distance between stage and the audience as well as requirements determined by digital and high definition cameras. At its most creative, special effects artists create fancy faces, fantasy creatures, characters from yesteryears, illusion of blood and gore, imaginative sci-fi creatures and fictional drama artist. This field is regarded as one of the most creative and challenging areas of makeup. Why One Should Opt Makeup Artist as Career? It is a suitable career for those having creative and artistic streak. It soothes your passion and paves a path to give shape to your imagination. It also lends a great learning about enhancing looks and color perception according to personality, set up, weather and surroundings. A makeup artist belongs to the aesthetic branch of cosmetology that specializes in the application of cosmetics to a person’s face, by using such products as foundation or powder, blush or eye makeup. A cosmetologist is trained in the study and application of beauty treatment, including hair and nail treatments. A makeup expert implements the ideas propounds by clinical cosmetologist. They give final shape to recommendations. Since this profession requires good business sense, diplomacy, networking, contacts with right people, working with people from diverse region, background and culture, one develops strong interpersonal skills, effective communication and tactics to convey correct message to the target audience. Make-up artists usually work indoors, and are often required to work long hours, late at night and will not be able to leave until a project is completed. They may also be required to travel to different locations for photo shoots, movie productions or to different work spaces. Such extreme challenges make you learn adaptive skills and adjust fast in a given environment. In fashion world, makeup professionals usually work under the direction of a photographer or fashion designer. They apply makeup that accentuates attire and fashion styles that models promote. Makeup artists also apply makeup to performing artists in plays, films, TV and fashion shows considering tone of artists, set ups and light arrangement. This indicates that makeup artists have to work in tandem with the production and creative teams. The average salary for a makeup artist can vary, depending on a number of factors. The pay structure depends on skill set and on profile of clients and industry. The rate also varies with the type and form of makeup. You will earn more if you are doing special effects makeup than the normal one. Remuneration also depends upon reputation of the makeup artist and the sector or industry in which they are involved. Career as a makeup artist in India has a lot of scope. Makeup artists who are self-employed and well-known within the industry can earn considerably more. Initially, one may earn between Rs 500-1500 a day. One can even charge per sitting. The earning can range between Rs 5000-10,000 a day for an experienced and well reputed makeup artist. In the film industry, professionals can expect a package of around Rs. 8,000 to Rs 15,000 per session. Academic qualification is not an essential requirement for a makeup artist. One has to have passion for the work and interest to experiment with looks or appearance. However, short term courses in cosmetology, beauty care, makeup can hone your skills. As a makeup artist, you could start as an assistant or apprentice to a reputed makeup artist. On-the-job training, either paid or unpaid, is considered to be of higher value than just academic qualifications. Looking to start a career as a makeup artist? Explore makeup artistry courses offered by Just Designs Institute. Enroll for the course and make a career in makeup.